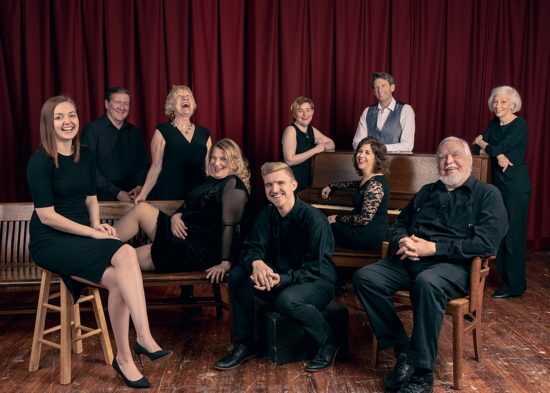 Some of the cast of Highwood Theatre’s 4D production of “Titanic,” now playing through March 24th, 2019. Photo courtesy of Highwood’s official Facebook page. For anyone unaware of the tragic story of the Titanic, this musical shows the doomed 1912 voyage from start to finish. One of the most interesting aspects of the show is that it tells the story from many different perspectives; the captain and crew, the shipbuilder and company man, and members of first, second, and third class, respectively. This musical’s complex and entrancing score helps to build the myth of the Titanic in the admiration and hope of the characters at the beginning of the show, making the tragedy of what unfolds even more heartbreaking. While most audience members already know what will happen to the “ship of dreams,” the suspense and dread instead comes from the relationships the audience builds with each individual character. Will they survive one of the most inexplicable disasters in history? So many things had to go wrong for Titanic to end the way it did- and this musical shows how it all unfolds, as well as the human stories that resulted. This show can be an arduous undertaking for any theatre company, which is why it is that much more impressive for a youth theatre company to take it on. Highwood Theatre was founded by Kevin Kearney in 2004 with the the goal of providing more and varied opportunities for local youth to participate in the theatrical world. His mantra is “anyone can do theatre” and he has worked hard to provide both theatrical education and performance opportunities for students in the area. The rehearsal process asks students to spend a few hours after school several days per week and starts about two months before opening night. Students are immersed in theatre, both front and back stage. Training is provided in acting and singing, alongside the finer points of lighting, costuming, and set design. The Production Company also has a no-cut policy: any eligible student who would like to join, can. Now celebrating their 16th season, the Highwood Theatre continues to look for new and innovative ways to serve young people and the local theatre community at large. This production is immersive in every sense of the word. Being billed as a “4D” production, the audience is surrounded by the world of the Titanic before they even step into the theater. As you walk to the Black-Box style theater, you can look at documents like the blueprints of the ship. Once you enter the theater, all your senses are engaged to transport you back to this ship. There are both set pieces as well as lighting that helps to set the mood, but they do not stop there. The audience literally walks through the set to get to their seats, giving them the feeling that they are too on the ship. This is compounded when the cast frequently walks either behind or through the audience at different points during the show. There are the sounds of seagulls playing as you take your seats, again engaging you by putting the audience in the dockyard mooring before the Titanic begins its doomed voyage. There are also a series of candles with different related scents that are burned during different scenes, again to fully immerse the audience. They use a simple but effective way for the audience to keep track of which characters belong to which class since some students play several characters. First class passengers have blue costume pieces and props, Second class have red, and Third have white. Each class also has its own section of the stage, highlighting the very distinctive class division within the Titanic, which tragically had bearing on the survival rate of the passengers therein. There are several other 4D surprises, but I won’t spoil them here. It is a truly unique theatrical experience. Founder Kearney spoke to the audience after the performance to share some more information about the students and the production itself. I was very impressed to hear that the cast and crew represented students from 3rd-11th grade, and it was obvious that an enormous amount of work and passion had been put into this show. It is inspiring to see these young people learning and growing in theatre right here in our local community. This is obvious in the fact that there was not a free seat at the performance I attended, and Kearney reported that it looked like the remainder of the run would be sold out. Even though the “ship of dreams” met tragedy, it was a joy to see so many students developing their theatrical dreams within the production. Running Time: Approximately 2 hours and 20 minutes with one 15 minute intermission. Advisory: There are a simulated gunshot and some disaster-related scenes, so audiences should be advised. There are also steps to get to the theatre and no elevator. 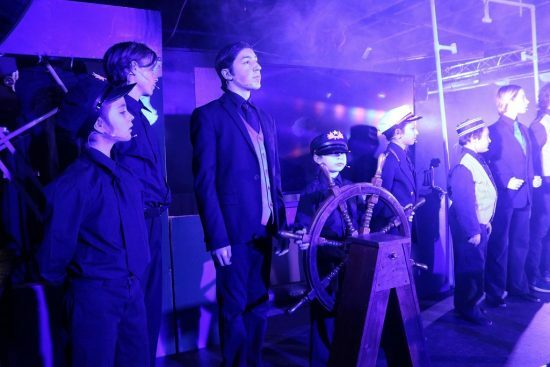 “Titanic, the Musical” is playing now through March 24th, 2019 at the Highwood Theatre in Silver Spring, MD. While the shows were close to being sold out last weekend, you can check here to see if there are any available tickets. You can also learn more about the Highwood Theatre here.